I won – This year I completed all my Christmas knitting in time and avoided having to wrap any half finished knitted gifts. What’s more I did so with an hour to spare! OK, it was Boxing Day, but it was done before our extended family arrived and no food was sacrificed in the completion of the knitted gifts so we were able to feed everyone as well. Compared to previous years this feels like quite an achievement. I lost however on the taking pictures of everything for the blog front. I had started a post which I’d titled ‘The Christmas Hat Parade’. 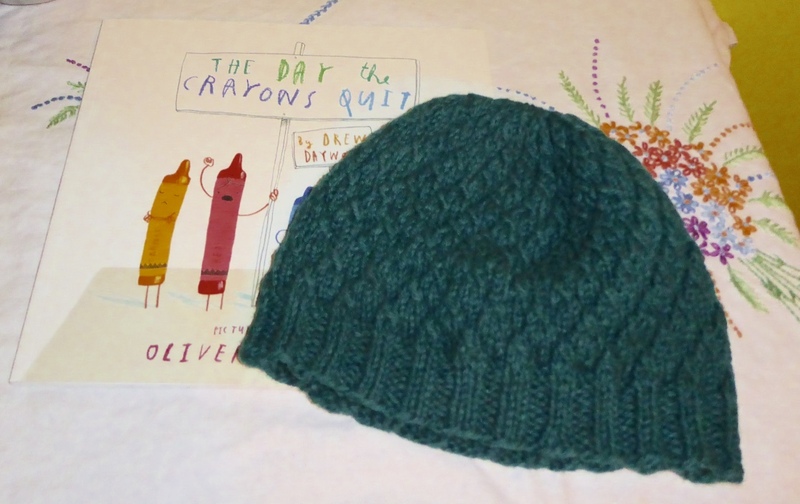 In this post I had intended to share pictures of the 4 hats I’d knitted. Instead I’ll just share the 2 pictures I have – these hats needed to be posted overseas so were earlier finishes. The first is a new hat design I’m hoping to have out in the next few weeks. 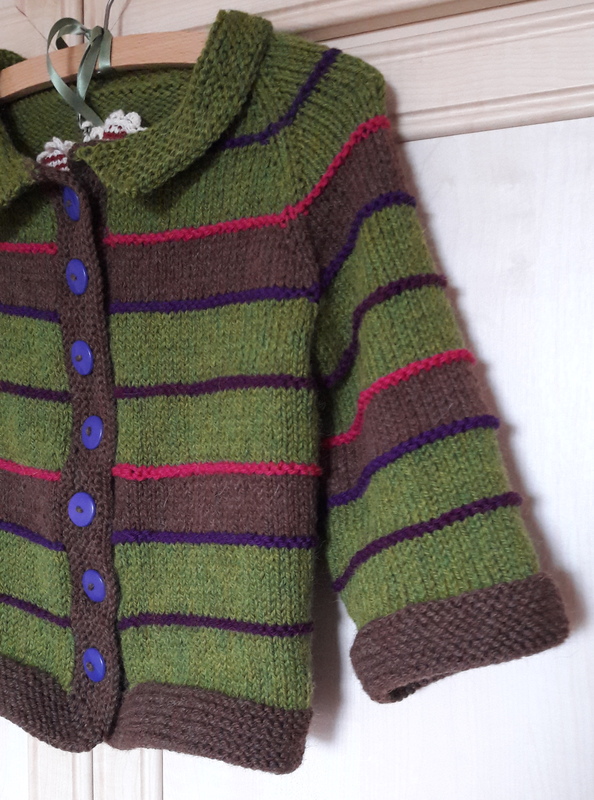 This was knitted for my nephew who also received ‘The Day the Crayons Quit‘ – I hope that made him smile as much as it did me when I read it in the bookshop. 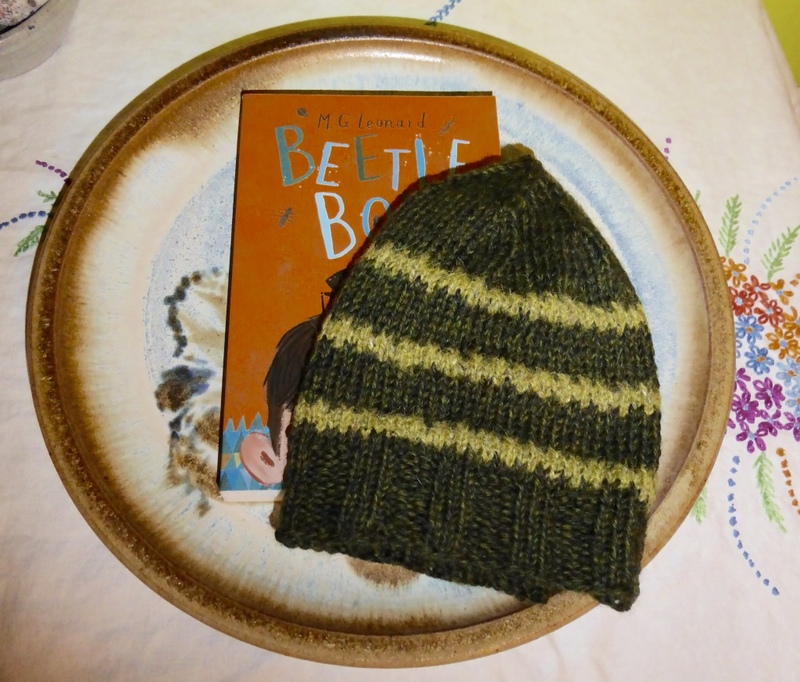 The second hat was for another Nephew and is one I made up as I went along and was paired with ‘Beetle Boy‘. The two not photographed hats are the Woolly Wormhead Mystery hat along from this year which went to my sister in law. I knitted the slouchy beanie and loved every minute of it. The other hat was a smaller version of the new hat on left in West Yorkshire Spinners Fusions Aran which knitted up nicely. I think that this yarn is nicer in the knitting that the ball would suggest. 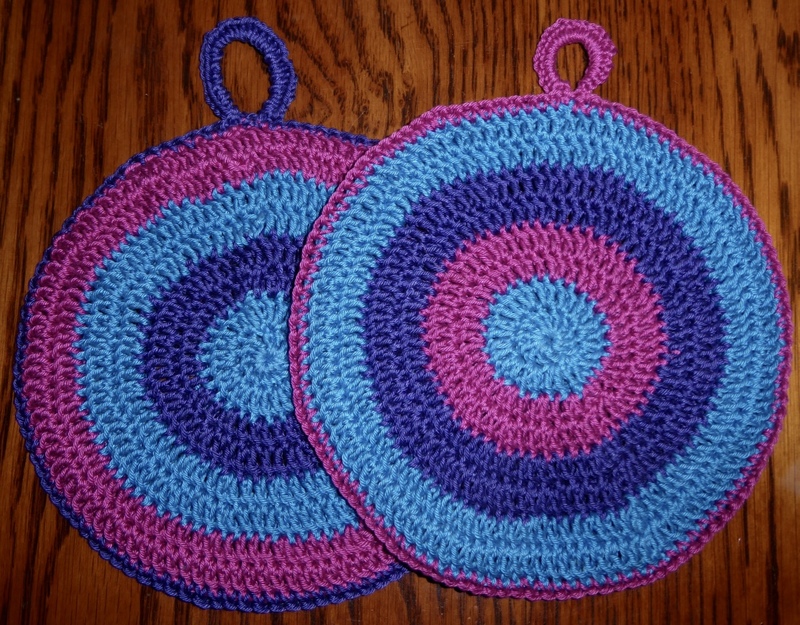 Then there was the ‘About the House’ post that was going to be about the housewares I knitted. These nearly derailed me altogether. The first was some last minute pot grabbers which I stayed up late one night to get into the post the next day – these even got a photograph. The real danger however came from a request from my Mum to knit a Christmas Pudding Tea Cosy for a family friend. The teapot it had to cosy up to however, was a huge 8 cup teapot and this meant I had to make up the pattern and had little time in which to do it. I went for garter stitch in a chunky brown yarn for the actual pudding but in retrospect a rib would have been easier. I did two large leaves from a Frankie Brown pattern and 3 large berries. For the cream on top I started with an Nicky Epstein basic circle pattern and then divided the stitches into 4 and knitted back and forth decreasing as I went. The tea cosy was sewn up with all the trimmings and fitted to the pot. Everyone else seemed thrilled with it, I was just relieved when it was done and sent it on it’s way without a camera coming close to it. 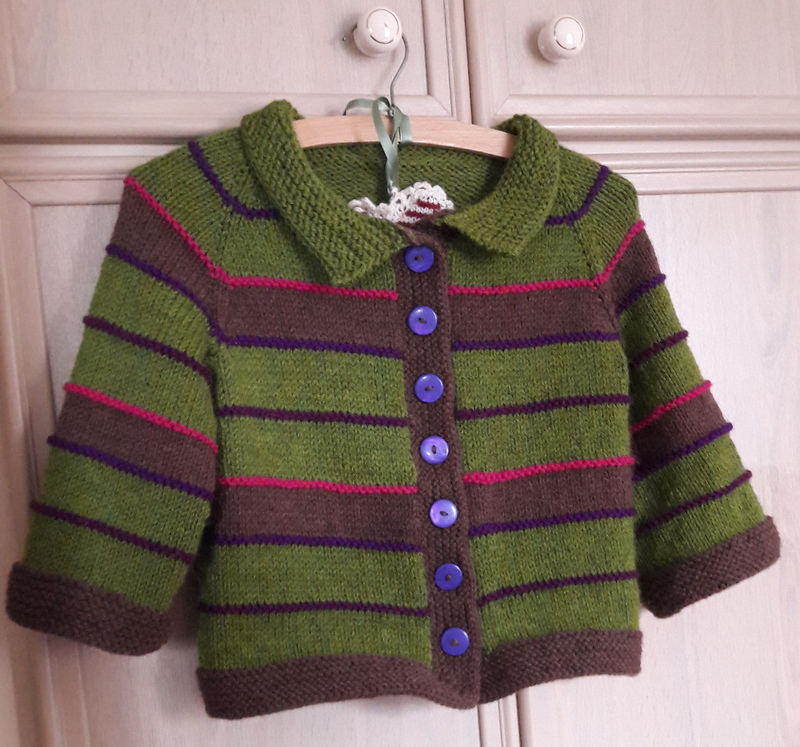 The relief was partly due to it being Christmas Eve and I still had 2 sleeves, button bands and a collar to go on my great niece’s sweater. It was this that came in just under the radar of Boxing Day lunch. Again this was largely made up as I went along. I used other patterns I’ve knit before for the cast on stitch count and a rough idea of measurements for a 6 year old – I wanted there to be a little room in it and I winged it from there. Starting with a provisional cast on at the neck it was knit top down. When I got the the bottom of the green I changed to brown yarn, picked up down one front for a button band, knit along the live stitches at the bottom hem and then picked up for the placket on the other side of the front and then knitted back and forth in garter increasing at the corners and making button holes on one side. I then worked across the top of the button band and placket picking up the stitches from the provisional cast on in between to make the collar. All in all, I’m pretty pleased that by Boxing Day I was able to cast on a pair of socks and engage in some no pressure knitting. This quickly shifted into Mitts as we were going away for New Year and I hadn’t packed any… What’s more I also achieved my aim of knitting all this year’s gifts from my stash.